Your iPhone is your camera. Now equip it with the Manfrotto KLYP+ system. 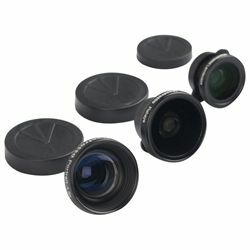 These three lenses screw onto the KLYP+ bumper to add amazing effects to the camera of your iPhone 5/5S. Each one is crafted from solid aluminum and outfitted with thick, high-clarity glass. The portrait lens is a 1.5x telephoto that enhances your subjects while defocusing backgrounds. The wide-angle 0.68x lens captures amazing panoramas and is particularly useful when you just can't "back up" any further. Modify reality wildly with the fisheye 0.28x lens which warps photos into round hemispherical images. Includes lens caps and a carrying case. Requires KLYP+ bumper, available separately.